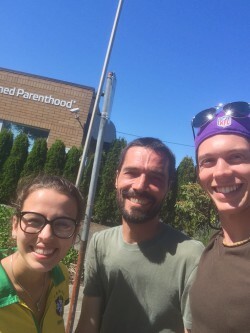 That was the spontaneous declaration of someone who had spent a few hours on the streets outside of Everett Planned Parenthood with me recently. Coming from a person who was raised on the mission field and who has dedicated his life to become a missionary, his statement was a wonderful confirmation of what I have thought for a long time. Over the years I have invited many people to join me on the streets. While some accept the invitation, most do not. So, I must admit that when Matthew and Ednay Abel called me on a Tuesday and said that they would meet me outside of Everett P.P. in about an hour, I was thrilled. I thanked the Lord for His people and remembered the boast that I had made to Matthew when inviting him, namely, that it would be unlike anything he has ever experienced. I was wrong. The truth is that when we show up in faith – in the jungles of Brazil or the wild streets of Everett – God faithfully shows up. For the next two hours, when we weren’t declaring the good news and preaching righteousness to Caitlyn, Tracy, and others we met, we shared sweet fellowship and encouraged one another in the Lord. We prayed for each other and took the above photo. As they left, I stood rejoicing on the hot sidewalk, imagining what great damage will be inflicted on the Kingdom of Darkness as this faith-filled couple goes forth in the mighty name of Jesus. We can’t all go to Brazil and that is a good thing. There are plenty of “savages” right here in our own community. Would you be willing to become a missionary if you could still be home by dinner? If so, just give me a call.